I had not made it to the previous four large-scale Moscow demonstrations for one reason or another. But despite the tightening of the screws on opposition leaders and protestors by President Vladimir Putin’s government in advance of the planned ‘March of Millions,’ I was set on going. Just days before the protest, Putin rushed to pass a bill sponsored by ruling party United Russia. This new law hikes the maximum fines for organizers of protests deemed illegal or unruly up to $32,000, and up to $9,000 or 200 hours of mandatory labor for participants. On the night before the protest, opposition leaders Aleksei Navalny, Sergei Udaltsov, Ksenia Sobchak and Ili Yashin had their apartments searched and had all their electronic devices confiscated. On the day of the demonstration, all four were called in for questioning regarding the May 6 demonstration, in which protestors allegedly started a brawl with security forces. 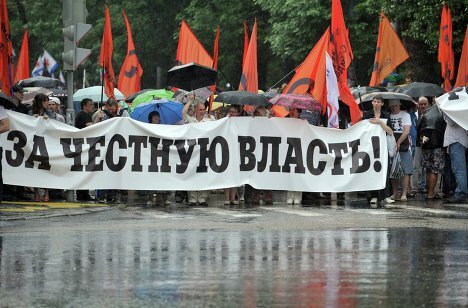 Udaltsov nonetheless led his Left Front party at the demonstration, explaining that this was his primary responsibility. The others did not make it. These primitive intimidation tactics by the government, aimed at dissuading supporters from gathering, did not have the desired effect. Riding up the escalator from the Pushkinskaya Metro station to the designated meeting place near Pushkin Square, I saw in front of me a young couple with a bohemian look and various piercings and knew I needed to follow them. But I soon learned that I could just as well have followed the four fashionably-dressed middle-aged women who stood behind me: ‘….Well, I just explained that I was going to the demonstration and could not make it to the dacha,’ I overheard one explaining. June 12 is a national holiday marking Russia’s independence from the Soviet Union and is attached to a long weekend. Coming out onto the square before noon, I saw that a large crowd had already formed and were beginning to pass one by one through metal detectors, with purses and bags being inspected by police. Special police units, known by their acronym as OMON, towered nearby in riot gear, resembling extras from Star Wars. I was propelled toward the front, where everyone had stopped, and we were told to wait for everyone else to gather before the march could begin as officially sanctioned at 1:00PM. The atmosphere was friendly and festive. The hot, humid morning broke into a downpour. People good-naturedly shared umbrellas, many got drenched, and more than one joked that the government had deliberately seeded the clouds. What struck me immediately was the vast diversity of the crowd. There were pensioners in their 60s, some walking with canes to which they had tied the opposition’s symbol of a white ribbon. The Russian nouveau riche were in evidence too, with dapperly-dressed men and tanned women in high-heeled sandals, laughing. There were students, professors and professionals. Polls indicate that the majority of demonstrators have a university degree or are in the process of getting one, with many from a middle-class background. As we all huddled, shoulder to shoulder, waiting for the march to begin, I turned to a conversation between two men in their late 60s who stood behind me. One was telling his friend that, ‘At least the Americans got it right. They’re about to pass the Magnitsky law and prevent a number of our country’s thieves from entering their country.’ He was referring to the legislation currently under consideration in the U.S. Congress that would impose sanctions on Russian officials allegedly linked to the prison death of 37-year old Sergei Magnitsky, a lawyer who exposed Moscow tax and police officials of having embezzled $230 million in state budget funds. The other elderly man responded saying that the KGB always had been evil, but in their latest incarnation under Putin ‘they simply get what they want without any limits’. It was interesting to see that the march had an underlying organisation. The different groups and parties represented were divided into what the Russians referred to as ‘columns’ or divisions. Leftist groups and communists were on the left side of Tsvetnoi Bulvar, the right leaning groups on the other. There were flags and banners of all colours for all causes and parties, along with balloons. There were orange flags with ‘Solidarity’ in black letters, blue flags emblazoned with ‘Democratic Elections,’ red communist flags, and those of other parties and various professional unions. People held green balloons with ‘Our Forest’ printed on them or blue balloons for democracy, or white for the opposition. A large banner called on for a ‘Sober Russia: Alcohol and Tobacco Free.’ An older man asked if I would take a picture of him holding onto a corner of this banner. ‘You, know, for a Russian fellow, this is really too funny!’ he explained. The absence of a compelling, realistic and specific plan for changing the government is something that all the opposition groups have in common. For now, this lack of an articulated common purpose and plan seems to play into the hands of the Russian government. But when I commented to a Russian friend that the deafening noise of the police helicopter overhead prevented many from hearing what was being said on stage, he answered, ‘Who cares what they’re saying. The people came here to feel the power of coming together.’ And then I remembered the little old man I saw walking among the people before the march began. He was smiling and waving a hand-made sign referring to Putin: ‘Don’t you feel sorry for Vovka? He must be real scared.